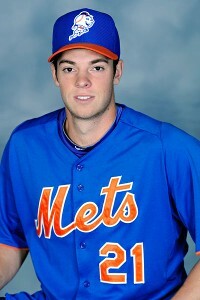 Although he was drafted with the Mets’ top pick in 2009 out of Ward Melville High School on Long Island, left-hander Steven Matz entered this season having made only six professional appearances. After a long road back from May 18, 2010 Tommy John surgery, Matz now appears clicking on all cylinders. With his family in attendance, Matz flashed a fastball that sat between 92-95 mph Friday while he tossed five scoreless innings for low-A Savannah at Lakewood, N.J. Still only 21 years old, the former second-round pick is 1-0 with a 1.29 ERA through three starts with the Gnats. He has allowed 14 hits and four walks while striking out 18 in 14 innings. Most importantly, Savannah pitching coach/fellow Long Island product Frank Viola noted, Matz has now thrown 81 pitches in each of his last two outings and is growing confident injury woes are behind him. “It’s so important to know you can do it,” Viola said. Matz believes the slider is more conducive to his natural arm slot. Nine months after being drafted, Matz required Tommy John surgery. Early in 2011, he resumed throwing off a mound. He had logged six innings in extended spring training and seemed on track for official minor league games. By that July, however, Matz had been sent back home to Long Island. Matz's 2011 return had been halted after micro-sized muscle tears in the left elbow area were discovered. He finally made it to Kingsport last summer, and closed that season with three straight scoreless starts before having to be prematurely shut down with rotator-cuff tendinitis. Now, though, those issues appear behind him. Matz still spends the offseason on Long Island, although he no longer is in his native Stony Brook. He commutes from Yaphank three times a week to work out with the group in Garden City that includes Jose Reyes and Mets minor league catcher Cam Maron. Average: Brandon Nimmo, Savannah, .414; Jayce Boyd, Savannah, .394; Kevin Plawecki, Savannah, .379; Juan Lagares, Vegas, .346; Josh Satin, Vegas, .344; Andrew Brown, Vegas, .343; Jamie Hoffmann, Vegas, .306; Brian Bixler, Vegas, .298; T.J. Rivera, St. Lucie, .293; Cory Vaughn, Binghamton, .292. Homers: Josh Satin, Vegas, 4. RBI: T.J. Rivera, St. Lucie, 19; Jayce Boyd, Savannah, 18; Kevin Plawecki, Savannah, 17; Andrew Brown, Vegas, 15; Cory Vaughn, Binghamton, 14. Steals: Alonzo Harris, Binghamton, 8; Darrell Ceciliani, Binghamton, 6; Cesar Puello, Binghamton, 5; Brian Bixler, Vegas, 4; Stefan Sabol, Savannah, 4. ERA: Luis Cessa, Savannah, 1.02; Rafael Montero; Binghamton, 1.59; Matt Bowman, Savannah, 1.62; Greg Peavey, Vegas, 1.84; Collin McHugh, Vegas, 1.93; Domingo Tapia, St. Lucie, 2.29; Hansel Robles, St. Lucie, 2.49; Logan Verrett, Binghamton, 2.55; Rainy Lara, Savannah, 2.70; Jacob deGrom, Binghamton, 3.24. Wins: Rafael Montero, Binghamton, 3; Logan Verrett, Binghamton, 3. Saves: Jeff Walters, Binghamton, 5; Hamilton Bennett, St. Lucie, 2; Chasen Bradford, St. Lucie, 2; Hunter Carnevale, Savannah, 2; T.J. Chism, St. Lucie, 2. Strikeouts: Rafael Montero, Binghamton, 27; Jacob deGrom, Binghamton, 24; Zack Wheeler, Vegas, 21; Noah Syndergaard, St. Lucie, 19. • Right-hander Rafael Montero, who drew positive reviews in spring training, is 3-0 with a 1.59 ERA in four starts for Double-A Binghamton. He has allowed 15 hits and one walk while striking out 27 in 22 2/3 innings. • Recently signed right-hander D.J. Mitchell threw five innings Tuesday in an extended spring training game. He now is set to join Triple-A Las Vegas’ rotation. • Amed Rosario, the 17-year-old shortstop signed out of the Dominican Republic for a franchise-record $1.75 million international bonus, is wowing onlookers in extended spring training, despite the older competition. Rosario is being described as a “lanky doubles and triples machine.” He is likely to play in the Gulf Coast League. One thing is certain: He will not be assigned to the same level as fellow shortstop/2012 first-round pick Gavin Cecchini, who is ticketed for Brooklyn when the New York-Penn League season opens June 17 at Staten Island. • Right-hander Michael Fulmer, who underwent surgery to repair torn meniscus cartilage in his right knee on March 12, has completed the rehab phase of his recovery. He is due to pitch an inning in an intrasquad game today in Port St. Lucie. Fulmer, the 44th overall pick in 2011 out of high school in Oklahoma, went 7-6 with a 2.74 ERA in 21 starts last season with Savannah. • Center fielder Matt den Dekker, who suffered a fractured right wrist on an attempted catch in a March 24 Grapefruit League game, is due to have the cast removed Monday. Den Dekker then will begin an approximate two-week rehab program to regain range of motion before beginning baseball activities. • Pedro Feliciano was placed on a temporary inactive list because of a family issue, a Mets official said. A second organization official said he believed Feliciano intended to work anyway with the extended spring training group when the Florida State League squad was on the road. • The Mets’ Triple-A affiliate is experiencing the same frigid conditions in Colorado the Mets did last week. The 51s’ game Monday at Colorado Springs was postponed because of weather. Tuesday’s doubleheader, which included the makeup, then was scrapped, too. • With Travis d’Arnaud sidelined for roughly two months with a nondisplaced fracture of the first metatarsal in his left foot, Wally Backman will have discretion how to divvy playing time behind the plate at Las Vegas. Since d’Arnaud’s injury, Landon Powell has started three games and Juan Centeno one behind the plate. There is an understanding, though, that Centeno has earned a share of playing time. The 51s also have German-born catcher Kai Gronauer, but he is currently on the DL in a paper maneuver to free a roster spot. • Ex-Yankees reliever Sean Henn has allowed four hits and a walk while recording two outs over his first two appearances with Las Vegas. • Cory Vaughn, after going 2-for-19 to open his Double-A career, has upped his average to .292. He has three homers and 14 RBIs in 17 games with the B-Mets. He is the son of former major leaguer Greg Vaughn.